Many operate from a belief that organizations, and lives, can be made successful through well-planned strategies and goals, supported by tightly-scheduled to-do lists. 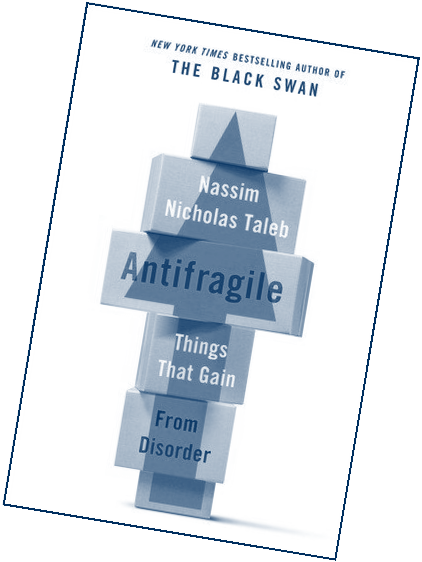 I have always questioned this belief system, and have never lived my life this way, Perhaps I am just looking to justify my obstinacy, however, a new book, Antifragile by Nassim Nicolas Taleb, has added fuel to the fire that burns within. In 1980, as a candidate for a Master of Science in Management at the Sloan School at MIT, I enrolled in the requisite course in corporate strategy, taught by Professor Mel Horwitz. We spent the semester studying exceptional corporations—those that exhibited results orders of magnitude better than average. The thesis of the course was simple: if we peer into the minds of management and discern the strategies that led down the road to success, we could repeat, or surpass their triumph. Near the end of the term, I asked a question. “Dr. Horwitz,” I began, “if we were to take a random sample of 1000 companies today, follow them for 20 or 30 years and plot their results on a chart, those results would undoubtedly form some sort of distribution, perhaps even a normal curve. Most of the companies would have moderate results—a bit above or below the average. There would undoubtedly be those whose results were far below average, and a few with results that beat the average in spectacular ways; it is the nature of the law of averages. That being the case, what is the possibility that we spent the semester simply studying the statistical outliers and nothing more. Is it possible their results had little to do with an extraordinary ability to peer into the future and divine a path to success? Could we simply be studying the lucky?” Suffice to say the kindly Professor Horwitz did not like the question. Enter Nassim Nicholas Taleb. Taleb believes what we did in graduate school—showing in hind-sight that a carefully followed strategy led to great results—is equivalent to lecturing a bird on flying, and then, after they have taken flight, claiming it was our cogent, insightful words that delivered the remarkable result. To fly is natural. After months of experimentation and “tinkering,” a fledgling takes flight by courageously stepping out of the nest and trusting she merely needs to spread her wings. Creativity, innovation and success are driven, not by well-planned strategies and tightly-schedule action plans, but through rabid tinkering and experimentation. Doubtful? Two words: Steve Jobs. I don’t know what allows a person to leave this life with a deep sense of satisfaction, but I have a hunch. It is not by checking one last item off a life-long list. I have never witnessed a bird with a checklist in advance of first flight…or for that matter, blueprints on how to build the nest from which to leap. If I never have the courage to spread my wings and leap into the unknown, will the final expression on my face be a fait accompli? At the end of a very successful, and completely redesigned, Chamber event, I turned to a member of the Board and told him I felt much of the success emanated from having turned many of the evening’s details over the young man who was emcee. “You should do that more often!” he suggested. The lightness of the moment did not ameliorate the painful way the comment pierced my psyche with its implication that I am otherwise too controlling. I need to tease apart, and try to understand, what the comment means, and how I will use it to move forward. Having planned and executed hundreds of events in my life—everything from small, casual lunches to community events capturing the attention of tens of thousands, I have long wandered the hallways that define event planning and project management. There are many doors that can be traversed in moving from concept to completion. Some lead into rooms filled with riches. They included “vision”, “mission”, “goals”, “values”, “teamwork”, “planning” and “attention to detail”. There are other doorways labeled in less-flattering ways. “Overly-controlling”, “my way or the highway” and “closed to new ideas”. These are the rooms one is not supposed to visit along the journey. But I wonder? The 1984 Los Angeles Olympic Games were organized under the attentive eye of Peter Victor Ueberroth. Through his leadership, those games became the first privately financed Games and resulted in a surplus of nearly $250 million that supported youth and sports activities across the United States. Compare that to the Montreal Games just eight years earlier that left that city with debt that burdened its citizens for 30 years. For reimagining the financial foundation of the Games, and perhaps even rescuing them from ruin, Ueberroth was awarded the Olympic Movement’s highest honor: the Olympic Order in gold. He was also named Time magazine’s Man of the Year in 1984. In the last few months, the creative genius of Steve Jobs, founder and visionary behind Apple computer, has been splashed across every medium of communication imaginable, including those that wouldn’t have existed had it not been for Jobs’ vision. But if you read reports of these two visionaries, they traversed all transoms I have seen along the hallways I have traveled. Each used vision, mission, values and teamwork in extraordinary ways. But make no mistake, for each, much of their vision was so clear and inviolate—contained so much personal passion—there was to be no compromise. I do not, nor will I ever, deserve to even be in the shadow of the likes of Peter, Steve or Dee. But in my own very, very small way, I have plied my creativity to help midwife a future slightly brighter than the past that preceded it. There have been many times I have crossed the thresholds of the politically correct doorways. And many times I borrowed from the rooms generally banned, and, when standing my ground on those things I felt were critical, I wielded the less desirable weapons of “overly-controlling” and “closed to new ideas”.